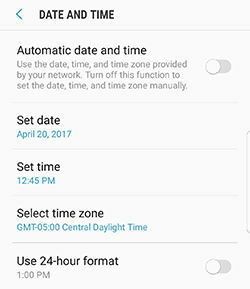 You can set the date and time on your device manually or automatically. 4. Touch Date and time. 5. Touch the slider next to Automatic date and time to turn it on. Note: This function should be activated by default. 6. Touch the slider next to Use 24-hour format to use the 24-hour clock system. When this function is activated, 2:45 PM will be displayed as 14:45. 5. 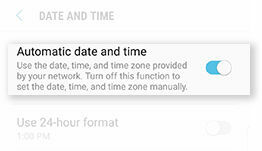 Turn off Automatic date and time by touching the slider. • Set date: Manually set the month, day, and year. • Set time: Manually set the hours, minutes, and AM/PM. • Select time zone: Manually set your time zone. 7. Touch the slider next to Use 24-hour format to use the 24-hour clock system. When this function is activated, 2:45 PM will be displayed as 14:45.